The Instantaneous Water Heaters (i.e. 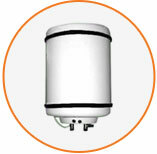 Gas Geysers) is an appliance where the heating of water is directly dependent on the draw off. The appliances shall be manufactured and tested in accordance with all the requirements of IS 15558, or BS EN 26 standards. a. Flame Failure Shut Off Device: The appliance shall have a flame failure device, controlling the admission of gas to the main burner and possibly to any ignition pilot, in case flame is extinguished. b. Over-heat Protection Device: The water heater shall have a suitable overheat protection device, which shall switch off the supply of gas if the temperature of the delivered water reaches 95 0C. The gas supply shall be restored manually. c. Gas and Water Stability Device: The appliance shall operate with tap fully open at gas inlet pressure at 21 mbar (g) without the flame extinguishing, blowing off or striking back and without the formation of soot. d. Oxygen Depletion Sensor / Incomplete Combustion Safety Device: The appliance shall have Sensor which can detect Oxygen and / or Carbon Monoxide (CO) at the same time. Gas Geysers shall not be installed through unauthorized persons. Customer shall call approach MGL Customer Care for Gas Geyser installation requirement. Geyser shall be only installed in a proper ventilated area and shall not be installed inside the bathroom.